Visiting 11 wineries in three days is a lot. It's also totally worth it when you've gone all the way to Napa. This is part 2 of our recent California adventure and fair warning, it's mostly just suggestions of places to eat and drink. We East coasters were early to rise again and at the great suggestion of our Airbnb host, we decided to take the long way to Napa via Sonoma and stop for breakfast along the way. The Sunflower Cafe in Sonoma Plaza was our first destination for the day. A welcoming spot, we ordered at the counter and grabbed a seat. Our coffee and monster mimosa (to share) arrived quickly and our breakfast followed not long after. It was a little chilly that morning, so we opted for seats inside, but the cafe has lots of outdoor seating too. At Caymus, we were welcomed into what used to be the owners actual dining room and greeted with a plate full of cheese. Our tasting guide quickly put us at ease, we realized the other couple at the tasting with us had a connection to Pittsburgh (this happens everywhere) and we enjoyed learning about the family owned and operated vineyard. At that point a little sustenance was required and without knowing it we all had the same idea about where to go for lunch, Gott's Roadside. The line is well worth the wait. Nom nom nom. We ventured to one more winery after lunch, Beringer, and opted for a reserve tasting in the Rhine House. It's a beautiful property and our tasting guide was fun and kept us laughing. The wines were OK, I'd definitely like them more after they had aged a bit. We were planning on a picnic lunch the next day and needed to pick up a few more supplies. We headed to Oxbow Public Market to see what we could find. After stocking up on bread, crackers, meats and more cheese. We stopped at the Napa Valley Distillery stall for an educational tasting. What did we learn? Never swirl your spirits like you would wine! *We shipped home bottles of their Old Hollywood Gin and Meyer Lemon Liqueur. After that we grabbed dinner at a little Mexican place within walking distance of the market, grabbed a drink back at our hotel's bar and then called it a night. We had a date with a limo and a few more wineries in the morning. Round 2 began at Jericho Canyon, another winery we probably wouldn't have discovered without our wine loving friends. This was the only place we actually opted for a tour of the vineyard as well as a tasting. Situated at the base of a mountain, the steep slopes made for beautiful views. Our tasting took place in their wine cave. We learned more about the sustainable practices of the vineyard as well as little more about what makes Napa Valley wine's distinct. We got the chance to sample some just harvested grapes and the juice that was being pressed out of them. *We shipped home bottles of their sauvignon blanc and cabernet sauvignon. Our next stop was Rombauer Vineyards for a tasting and picnic lunch. 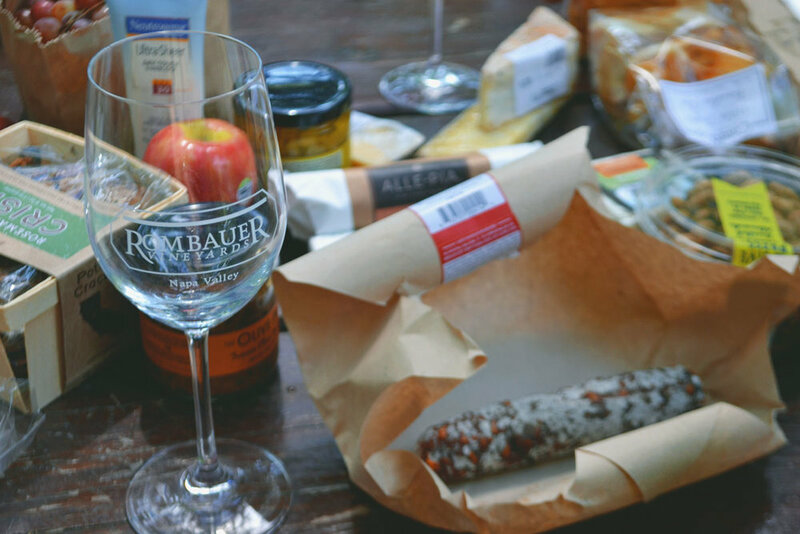 We learned there are some strict standards when it comes to eating at vineyards, but Rombauer is one of the few where you can and they have some gorgeous gardens perfect for picnicking. After our tasting we took two bottles and laid out our spread. *We joined the wine club here. Our last winery of the day was the newly remodeled Joseph Phelps. After a quick tour we were led out to the terrace for our tasting. We've all been fans of the winery's cabernet for a few years now. It was a treat getting to reminisce about our first bottle while trying a few more. * We shipped home bottles of the Insignia and Quarter Moon Pinor Noir as well as joined their wine club. We called it an afternoon at that point. We all needed a little time to clean ourselves up (and sober up a little) before our highly anticipated dinner at The French Laundry. We came to California to celebrate Rob's & his twin brother's 30th birthday and this was the piece de resistance. My mother-in-law had wanted to visit this world famous restaurant for years and there was no way I was going to Napa without trying to get a reservation. 8 calls and 25 minutes on hold was completely worth it for the experience we had. I didn't take any pictures while we were there. Gasp! There are just some things in life you need to experience for yourself and this is one of them (if bucket list dining experiences are your thing.) There was no way my dimly lit pictures could do the food justice and I was determined to take in every moment of this meal with my god-given senses. Luckily my mother-in-law did manage to snap a photo of Rob and me with our champagne.